Statewide snowpack totals increased considerably during February. As a whole, Colorado received above normal snow accumulation throughout the past month as multiple storm systems moved through the state. As of March 1, the state’s snowpack was 116 percent of median and statewide precipitation total’s for February reached 133 percent of average, according to Phyllis Ann Philipps, Colorado State Conservationist with the Natural Resources Conservation Service (NRCS). Colorado’s snowpack has tracked above the long-term normal for three consecutive months. Once again this year’s “No-Nino” weather patterns favored the northern and central mountain ranges in Colorado. The southwest part of the state, the Upper Rio Grande and the combined San Miguel, Dolores, Animas and San Juan basins, are still experiencing below normal snow conditions for this time of year. The combined San Juan basins did see a 3 percentage point increase from last month and are currently at 85 percent of median. The Upper Rio Grande basin on the other hand lost five percentage points, dropping to just 79 percent of median. Reservoir storage across the state remains just below average, at 89 percent of average; this is a great improvement over last year’s conditions at this time when storage was just 67 percent of average. 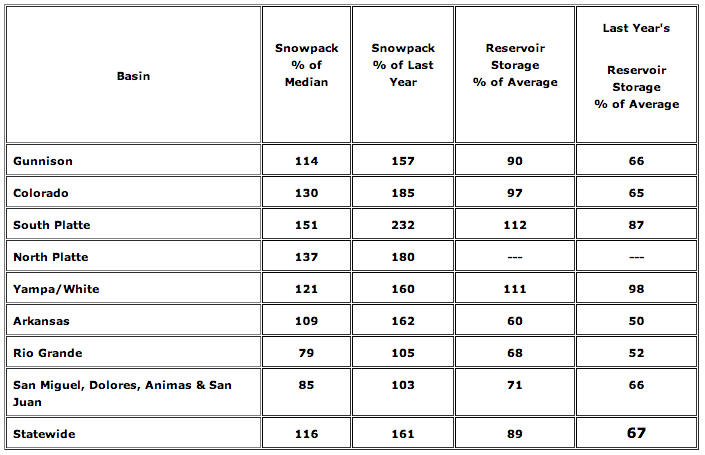 With the current snowpack conditions and storage volumes drought conditions in most basins should be alleviated and reservoir storage should improve this spring. Data collected during the recent snow surveys directly reflects what the state can expect for surface water supplies this coming spring and summer. The most recent streamflow forecasts continue to point towards, above to well above normal volumes for this spring and summer in most of the major river basins in Colorado; the exceptions will be the Upper Rio Grande and southwest basins. 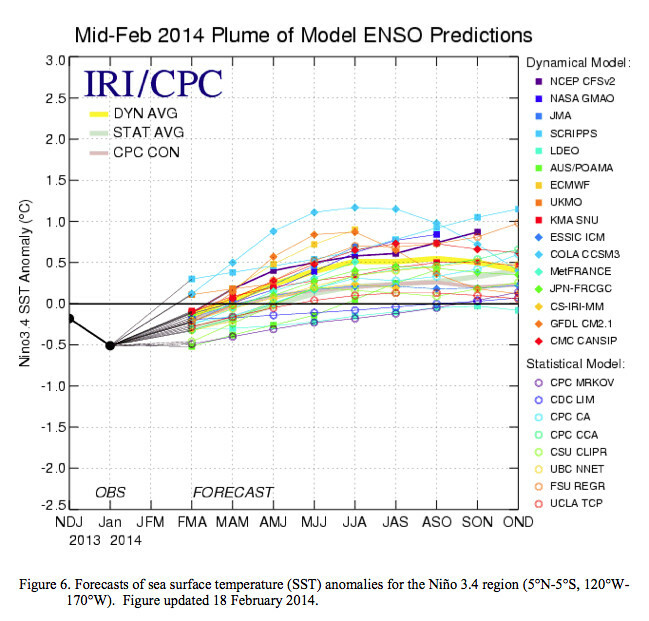 ENSO-neutral is expected to continue through the Northern Hemisphere spring 2014, with about a 50% chance of El Niño developing during the summer or fall. Click here to read the current discussion. 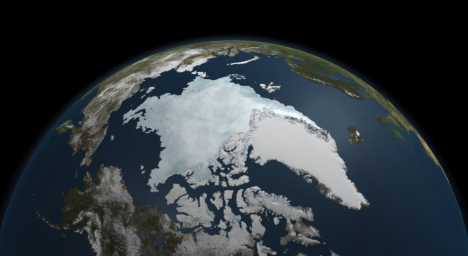 Synopsis: ENSO-neutral is expected to continue through the Northern Hemisphere spring 2014, with about a 50% chance of El Niño developing during the summer or fall. Congressman Scott Tipton’s (R-CO) Hermosa Creek Watershed Protection Act of 2013 (H.R. 1839) received a legislative hearing in the House Natural Resources Subcommittee on Public Lands and Environmental Regulation. The community-driven legislation would protect the Hermosa Creek Watershed—a 108,000 acre area in the San Juan National Forest north of Durango—as well as protect multiple use of the land. Read Tipton’s opening statement here. The Hermosa Creek Watershed Protection Act has been endorsed by a broad coalition of stakeholders including: the City of Durango, the La Plata County Commission, the Southwestern Water Conservation District, the San Juan County Commission, Region 9, the Colorado Snowmobile Association, Jo Grant Mining Company, Inc., in addition to numerous business and sportsmen groups, among others. Tipton submitted their letters of support to the record. During the hearing, Scott Jones, a representative from the Colorado Snowmobile Association and other Colorado-based off road groups, testified in support of the legislation. Read Scott Jones’s testimony here. Under H.R. 1839, much of the land will remain open to historic uses, including mountain biking, motorized recreation, hunting, fishing and selective timber harvesting. Grazing will be permitted in the entire watershed. This legislation ensures that areas currently open to snowmobiling on Molas Pass will remain open for future use. This will benefit outdoor recreation enthusiasts and continue to provide an important source of economic activity for the area. If this bill is not passed, then snowmobiling will cease in this region following the 2013/2014 winter season. This legislation also contains important provisions that allow for active land management in areas designated by the bill as necessary to control wildfires, insect infestations and disease outbreaks. H.R. 1839 will now need to receive a markup in the full House Natural Resources Committee. Senator Michael Bennet (D-CO) is carrying companion legislation in the Senate (S.841). Learn more about the Hermosa Creek Watershed Protection Act here. Within three years of the bill’s passage, a management plan would have to be developed for the area, based on recommendations from the Hermosa Creek River Protection Workgroup, a diverse group of constituents. About 37,000 acres of this area, on the west side of Hermosa Creek, would be designated as federal wilderness. No road, mineral or other development would be allowed inside this area. About 68,000 acres, mostly on the east side of the creek, would be designated as the “Hermosa Creek Special Management Area.” It would remain open to historic uses, including mountain biking, hunting, fishing, motorized recreation and selective timber harvesting. Grazing would be allowed throughout the protection area. The area in the bill has long been recommended for a wilderness designation and is some of the most pristine in Southwest Colorado. The land surrounds Hermosa Creek, which flows into the Animas River and is an important water source for Durango and surrounding areas. He says the water in Hermosa Creek is much better quality than in the Animas and provides dilution and better overall water quality. Many studies since the Wilderness Act passed in 1964 have recommended a federal wilderness designation for this land, but it has never materialized. For the last six years or so, people in the area have worked on the bill to preserve the historic use of the land and give it a wilderness designation. The House version of the bill will be scheduled for markup by the full committee and voted on. “I am confident that there will be no pushback on the bill from the committee,” Tipton said. He thinks the bill will move forward quickly and said he would work to expedite the process. Sen. Michael Bennet, D-Colo., introduced the bill in the Senate in April 2013. The Senate version is co-sponsored by Sen. Mark Udall, D-Colo. It received a committee hearing in the Senate in November, but has yet to be voted on in committee. According to Philip Clelland, Bennet’s deputy press secretary, his office is working with the committee and is hopeful that a vote will be scheduled soon. Colorado must work with neighboring states to develop a Western water plan, Gov. John Hickenlooper said Thursday. “We don’t want the federal government coming in and telling us what to do,” Hickenlooper told the state basin roundtable summit. Hickenlooper, a Democrat, and former Gov. Bill Owens, a Republican, spoke to about 300 roundtable members and other members of the state’s water community during an all-day meeting to discuss water issues. The roundtables were formed by the Legislature in 2005, when Owens was governor. They were the brainchild of then-Director of Natural Resources Russell George. Hickenlooper said the roundtables are providing grass-roots direction for a state water plan he has tasked the Colorado Water Conservation Board to draft by the end of this year. Action on the water plan is needed quickly both within the state to deal with drought, floods and wildfires the state has witnessed in the last two years, he added. Climate change and compact obligations of all basins within Colorado dictate that Colorado work with other Western states to protect water supply in the future, Hickenlooper said. “We need to be ready in the future to build relationships in order to reach the compromises we may have to reach later,” he said. For his part, Owens stressed the need to develop more storage in Colorado. More IBCC — basin roundtables coverage here. More HB1177 coverage here. One of the 13 formal “statements of opposition” filed in the case as of Thursday comes from another of Glenwood Springs’ major recreational attractions, the Glenwood Hot Springs Pool. The Hot Springs, in a Feb. 27 water court filing, renewed its long-standing concerns that any whitewater park features constructed in and along the river near the springs’ aquifer could potentially harm the springs. “Operation of the [proposed] Two Rivers Whitewater Park facilities may inundate and damage portions of the Colorado River riverbed and adjacent river banks,” which could in turn damage the Hot Springs Pool facilities, according to the filing by Hot Springs attorney Scott Balcomb. The city now hopes to build on the economic success of the whitewater sports boom by building a second play park. To accomplish that, however, it will have to negotiate with the various entities that have filed as opposers to make sure their concerns are satisfied. That could take several years, said Mark Hamilton, a water attorney who is representing the city of Glenwood Springs in ushering the case through Colorado’s water court. “For a case like this, that’s not unexpected,” he said of the number of entities that have taken the formal step of opposing the city’s RICD request. Just because an entity files a statement of opposition doesn’t necessarily mean that they will ultimately object to the request, Hamilton explained. It just means that they want to be party to the negotiations so that any current or future concerns are heard as the plans take shape, he said. Hamilton said he believes the proposed Two Rivers Park location would be far enough downstream from the hot springs that it should not be a concern. 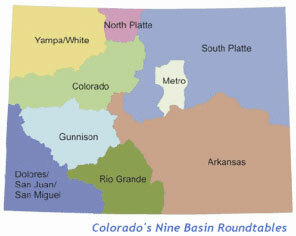 Other heavy hitters that have filed to be part of the discussions include the Denver Water Board, the state’s largest water utility which owns significant water rights on the Colorado River, plus the city of Colorado Springs, the Colorado River Water Conservation District, the Colorado Water Conservation Board and several upstream and downstream water users. Denver Water would not have been able to oppose the request by Glenwood Springs under the recent new Colorado River Cooperative Agreement it signed with Western Slope water interests, except that the request is for more water during certain times of the year than Denver had agreed to in that deal, Hamilton also said. The city’s request seeks a “shoulder season” base flow of 1,250 cubic feet per second during the month of April each year and again from July 24 through Sept. 30. That is less than the 1,280 cfs Denver Water agreed it would not object to. However, Glenwood also requests a maximum flow rate not to exceed 4,000 cfs for up to five days between May 11 and July 6 each year, and 2,500 cfs for as many as 46 days between April 30 and May 10 and July 7-23. The extra amount during those times could impair Denver Water’s ability to divert water under the separate Shoshone relaxation agreement, according to the utility’s statement of opposition filed Feb. 28. Further, the request could also affect Denver Water’s ability to implement its agreement with Grand County for municipal, snowmaking and environmental purposes, the utility claims. Grand County, which recently had its own RICD request OK’d, filed a formal statement of support for the Glenwood Springs request. Hamilton said the case has been assigned to a water referee in Glenwood Springs to oversee the initial negotiations. There will also be an administrative hearing before the Colorado Water Conservation Board, which will make a recommendation on the request. He noted that the Grand County case is nearing completion after about 3-1/2 years, while a similar request recently granted to the town of Carbondale for a RICD on the Roaring Fork River took multiple years to process as well. Three of the objectors are municipal water providers on the Front Range — Denver Water, Aurora Water, and Colorado Springs Utilities. They depend on water from the Colorado River basin and are concerned about new recreational water rights limiting their future water management options. Three entities — the Colorado Department of Transportation (CDOT), the BLM and the Glenwood Hot Springs Lodge and Pool — are concerned about the proposed locations of the whitewater parks. 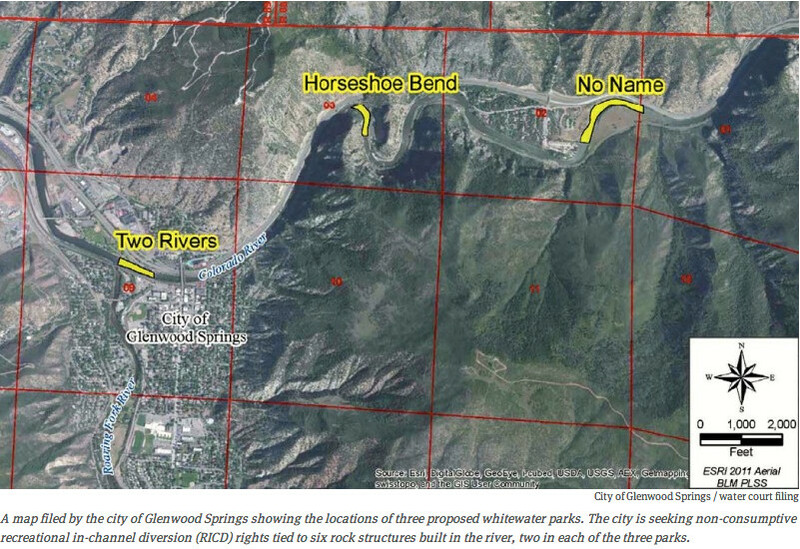 The Colorado River District, which represents 15 counties on the Western Slope, is generally supportive of Glenwood’s application, according to the district’s attorney Peter Fleming, but like the Front Range entities, it also has concerns about limiting the amount of water available for future junior water rights upstream of the proposed whitewater parks. Another four entities say they just want to monitor the case: the town of Gypsum; the Orchard Mesa Irrigation District in Palisade; the Ute Water Conservancy District and the Grand Valley Water Users Association, both in Grand Junction. The Colorado Water Conservation Board (CWCB) also filed a statement, as it routinely does for applications of a new “recreational in-channel diversion right,” or RICD. The state agency is charged with reviewing such proposals and sending findings to water court. And that’s the amount of water for a Glenwood whitewater park that Denver Water said it could support in the recently finalized Colorado River Cooperative Agreement, which was signed by Denver Water and 17 other entities. And the Glenwood Hot Springs Lodge and Pool is concerned that wave-creating structures built in the river near the hot springs pool could harm the underground aquifer that supplies hot water to the pool. Kjell Mitchell, the president and CEO of the Hot Springs Lodge and Pool, said engineering studies have shown the boundary of the underground aquifer extends from above the pool to below Two Rivers Park. The city has proposed that one of its whitewater parks be built just above Two Rivers Park. “The primary issue of our concern is the potential scouring of the river which could create a hole in the bottom of the river and damage the aquifer,” Mitchell said.